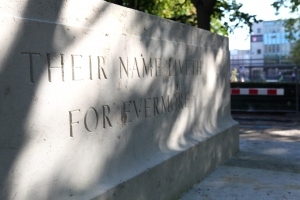 The Southampton Cenotaph website contains the stories of servicemen and women from Southampton, England, who died in the First and Second World Wars and are commemorated on Southampton Cenotaph and the Memorial Wall. The website was launched in March 2012 and was created and designed by Southampton Solent University students Jack Hannaway and Hannah Watts. Jack was studying studying for his M.A. in Multimedia Journalism and Hannah was working towards a B.A. in Media, Culture and Production. Information was provided by the late Celia Fraser who initiated the Families and Friends Group and the project was and is supported by Steve Hogg and Paul Marchbank, Head of the School of Media, Southampton Solent University. The aim was to create an interactive website that would enable families, students, schools, local researchers and others to contribute to the information about the Cenotaph and bring to life the stories of those named on the Cenotaph and their families. This website contains copyright materials (images and text), much of it provided by families of the Names whose stories we tell. Out of respect please do not take copies of this work without seeking prior permission. Use the Comments box to write to us. Your co-operation would be appreciated by the families and members of the Southampton Cenotaph Families and Friends Group. The Families and Friends research Group has gone from strength to strength and is continually supported in partnership by Southampton Solent University, together with many servicemen’s relatives who provide information, documents and photographs for the sites use with their work. We are proud to have the Worshipful Mayor of Southampton as our patron. Hi, really interesting to know that a Southampton group is following up on the histories of all the people remembered on the Cenotaph. I am interested in Reginald Deahl. He died in October 1917, possibly at Passchendaele. He was the brother of my grandfather Arthur Owen Deahl. For decades, Reginald’s name was mis-spelt as Deakl, but some other family members got it changed to the correct spelling about 2000. I have two Aunts still alive who remember the impact on the extended family that Reginald’s death had so will ask them and send it in to you. I would be interested in finding out about Reginald myself if you have any info on how to research an individual’s history in WW1, or to work with you if one of you takes this on. Thanks and keep up the valuable work. Yes we have Reginald Deahl on our list as yet to be researched. I will gladly start the research about him and work with you. My email address is brendawhite05@aol.com if you have a photo of him that would be excellent.Keep in touch. Reginald Deahl who is on our list, who I am researching had a father whose name was George Edward, but does not appear to have a brother Arthur Owen, was it defintely a brother or could it have been cousin? Can you please confirm the fathers name of the Reginald you are interested in and the names of your aunts to confirm the family. There is certainly 2 Reginald Deahl’s born within a year of each other, but so far I can only see that one died during World War 1. Brenda White for Southampton Cenotaph. I have just spoken ( and emailed ) Andy Russel to let him know about a name that is misspelled/wrongly attributed from WW1 and hopefully he can include the change at the next available update . Andy suggested I write to you with the details ; his name is Pte. Arthur Charles Barton 23627 5th Bn. Royal Berkshire Regiment who died on 29th April 1917 and was a resident of Southampton . The name shown on the Cenotaph is Arthur C Bartley ( and a search under this name reveals no service records or census returns )hence my belief that it is a simple mistake. I am not a relation but do have his memorial plaque ( which I am considering what best to do with ). I hope this information is of interest to you .